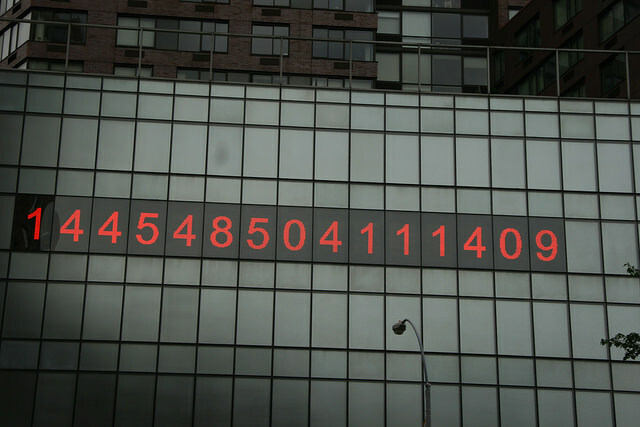 On 14th street, just south of Union Square there’s a great big digital clock on the side of a building… well, the first time you see it you may not know it’s a clock, but it is. A photo probably doesn’t do it justice, you should probably watch a video to get the full experience. To the uninitiated, it’s unclear what this rapidly-changing series of 15 numbers represents. It’s actually 2 clocks, one counting the time that’s passed so far today, and one showing how much time is left in the day. To read it, start at the left: 2 digits for hours, 2 digits for minutes, 2 digits for seconds, 1 digit for 10ths of a second, 1 digit for 100ths of a second. The right side is in reverse order, counting down: 1 digit for 10ths of second, 2 digits for seconds, 2digits for minutes, 2 digits for hours. You can link to it on github pages here. It’s responsive, so the numbers should scale for whatever device you load it on. I can’t wait to load it on my phone form Union Square to check my work.